CD review: "The Complete Chess Studio Recordings"
This handsome two-disc CD set will be a welcome addition to any collection. 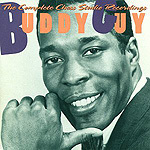 Recorded at the legendary Chicago Chess Brothers' studio from 1960-66, this collection highlights the early Buddy Guy, full of talent and enthusiasm, yet still finding his way. As with any artist who's achieved legendary status, it's impossible to critique Buddy Guy's formative years without the filter of his subsequent successes and triumphs. He already had all the ingredients present from the get-go: the chops, the sense of presence, and the dramatic flair. The guitar playing, of course, is stellar. Somewhat surprising is the strength of his vocals, closer to Johnny Taylor or Bobby Bland than to his own guitar pyrotechnics. Fans more familiar with Guy's live performances might be surprised by the fact that he plays a little less guitar here than he does in clubs or festivals, but they are unlikely to be disappointed. Guy's vocals are just as rewarding as his fretwork, and the material is so varied that boredom is impossible. Beautifully illustrated with numerous photos, and superbly accompanied by Don Snowden's liner notes, "The Complete Chess Studio Recordings" is itself a work of art.